Sunset Villa East epitomizes living the Cool Runnings island lifestyle. It creates peace, serenity, and relaxation when inside or outside enjoying the majestic views it has of the surrounding islands. Our guests say Sunset Villa East takes you to dream land. 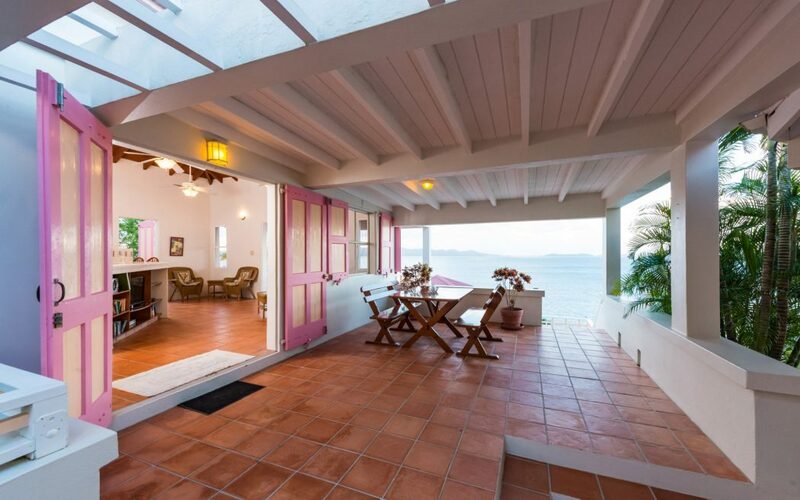 This villa is unique at White Bay Villas as its primary view is of Tortola, St John, and St Thomas. The villa boasts breathtaking architecture, tile floors, an open floor-plan in the raised kitchen and great room, and three amazing patio areas. The great room features ceiling fans, a flat screen TV, Roku, high speed internet, a stereo, telephone, and double futon*. The kitchen is fully equipped with a six burner stove/oven, large microwave, coffee maker, blender, French press, fine cutlery, cutting boards, spice rack, and full-size fridge/freezer. There is a large BBQ outside. The master bedroom is elevated with an ensuite master bath, queen-sized bed, ceiling fans, air conditioning, and huge double doors and windows that open to the constant yet gentle trade winds, exposing a spectacular vistas of St Thomas and Tortola. The second bedroom has a modest private bath, queen-sized bed, ceiling fans, air conditioning, and large windows that expose the view and breezes. Sunset Villa East features a large grass patio with direct access to a sitting gazebo with views straight from a story book. ‍*Note: if sleeping for 2 additional persons is desired, the large futon in the great room may be used. "We live in the Virgin Islands and a group of girlfriends went away for a long weekend. We stayed in Sunset Villa East and it was just perfect. Right from the booking process, questions, meet and greet and the actual villa itself, we could not have asked for more. The level of Customer Service delivered by Michelle when she met us on the first day was impressive and she was a very friendly and helpful lady. The villa is well designed and equipped, and the view! We will be back. Thank you!"